Ben Affleck accepted yet another big award for Argo last night, taking home the Producer's Guild Award for Best Picture following on the heels of his wins at the Critics Choice and Golden Globe Awards. 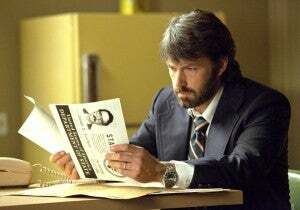 The film, which traces the true story of a CIA operation that used props and concept art (by comic book legend Jack Kirby) from an abandoned science fiction film to rescue American hostages trapped in the Middle East, featured Affleck as its star and director. It's been nominated for a number of Academy Awards, although Affleck was left out of consideration for a Best Director Oscar. Argo was also recently honored with a Golden Tomato, signifying that Argo was 2012's winner for ‘Best Reviewed Film In Wide Release’ with a 96% positive score at Rotten Tomatoes. It beat out Looper, Marvel's The Avengers and Skyfall for the honor. The Dark Knight Rises came in at #9 on that list, barely edging out Lincoln, another film that may be competing with Argo for Best Picture consideration at the Oscars. Talking with ComicBook.com about his film Science Fiction Land, which covers the same story as Argo but in a documentary fashion, director Judd Ehrlich said, "We were dealing with many of the themes that I think are now brought even into focus with Argo coming out because we were looking at the line between fiction and reality, fantasy and reality, and so many of the characters sort of live in between those two things. With a Hollywood film coming out, it’s yet another version of the truth, and one that many people will view as the truth but as we know it’s very highly fictionalized and dramatized to make for a compelling film that’s going to do big at the box office around the world."